Let's explore the lands of the Knigts of the Temple, medieval legends and where the action of Palmeirim de Inglaterra, one of the most famous portuguese chivalric romances, takes place. 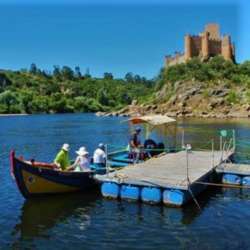 We will sail on a traditional river Tagus boat to the island of Almourol and do a guided tour of this magic castle from the XII century. We will also visit Constância, on the mouth of Zêzere river, and Vila Nova da Barquinha on the banks of the Tagus. The tour will start and finish at Oriente train station, and travel will be by private minibus. It's April in Portugal and we are happy!